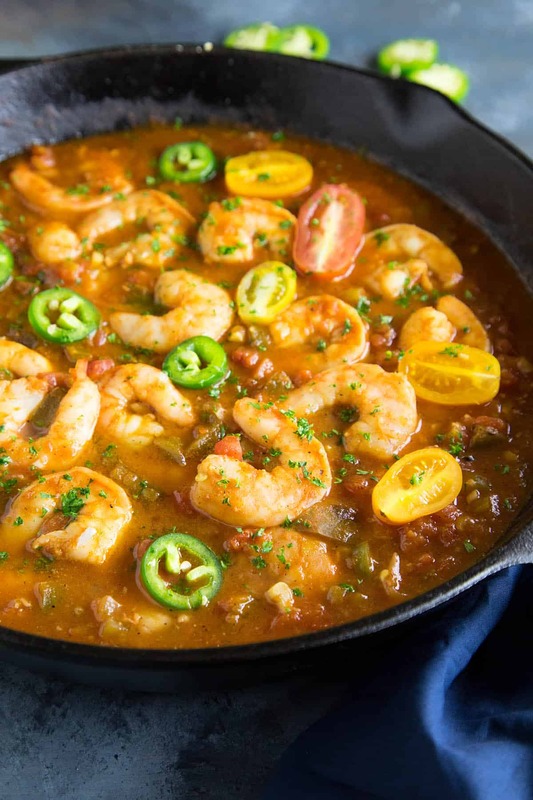 This recipe is pure New Orleans, an icon of Louisiana, with succulent shrimp simmered in a perfectly seasoned tomato sauce made with the Cajun holy trinity. You may need to make an extra large batch. I’ll take mine extra spicy. Shrimp Creole coming your way, my friends. I LOVE this recipe. It’s EASY for one. I’ve been really trying to update my Quick and Easy Recipes lately, as that is the focus of my new cookbook that is coming out in October, called “The Spicy Food Lovers’ Cookbook“. The idea is to share with you recipes that are easy to prepare, yet BIG on flavor and spice. Basically, it’s everything I want in life! I just turned it into my publisher and am waiting on changes, but DANG was it fun to write. I include a few different shrimp recipes, but this one is a total CLASSIC that, to be honest, is surprising I don’t have on the site already. I was like – WHAT? I need a Shrimp Creole recipe on the site! 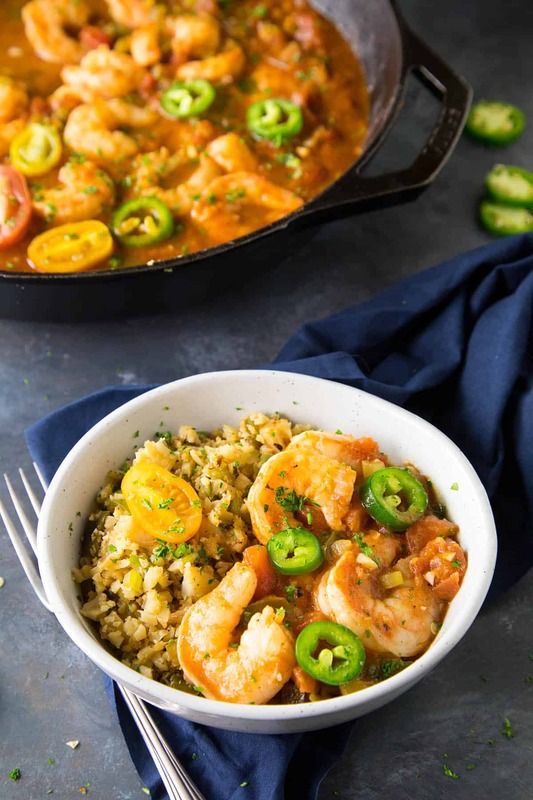 You NEED Shrimp Creole in your life! It’s a recipe that’s been around forever, and it’s open to certain interpretations, so feel free to customize here and there to your personal tastes. 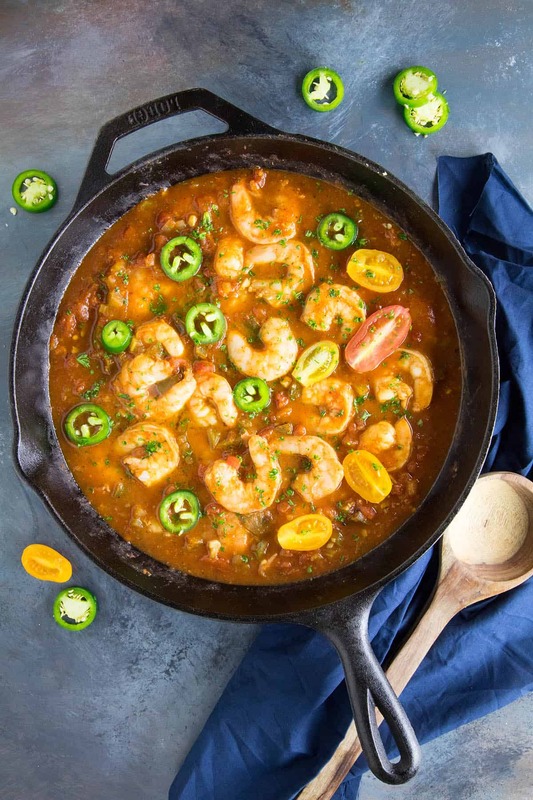 I like to use the classic Cajun Holy Trinity to start – bell peppers, onion, and celery – though I’ll either substitute jalapeno peppers for the bell, or I’ll toss a jalapeno into the mix, or sometimes something spicier, like a serrano pepper, or maybe a habanero pepper. Ghost pepper, anyone? Yeah, you can go REALLY spicy on this if you’d like. Just don’t surprise your dinner guests, OK? Haha. 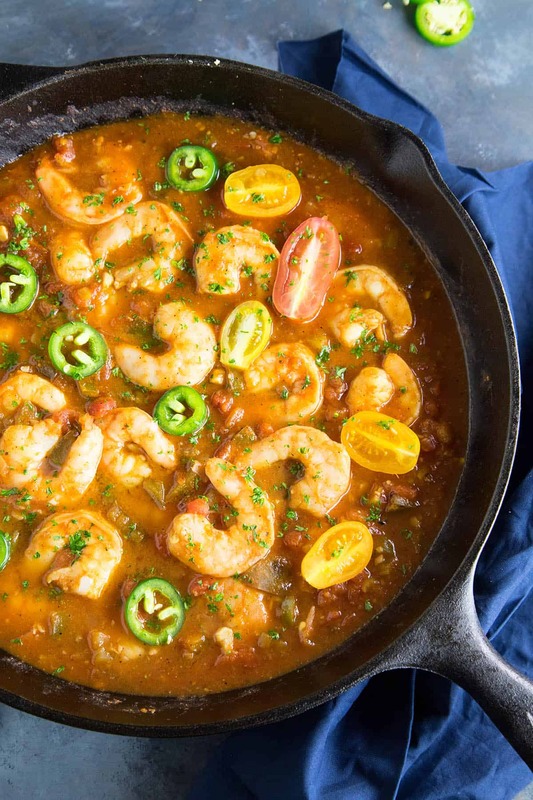 Making Shrimp Creole is easy enough. First, cook down your peppers, onion, celery and garlic in a pan with some oil until they soften up. Next, stir in some tomato paste and cook it down about a minute. Then, add canned tomatoes, stock, Worcestershire sauce, hot sauce, Creole seasonings and bay leaves. Adjust for salt and pepper to your preferred levels. Stir it all together and let it simmer for 20 minutes to thicken and let the flavors develop. You can simmer longer if you’d like. Remove the bay leaves, then add the shrimp and tuck them under the sauce. Cook another couple minutes, or until the shrimp is nicely pink and cooked through. Finally, serve it over rice, if desired, sprinkled with parsley, extra hot sauce and extra peppers! Or just eat it out of the pan. It’s OK. Really. I served mine over this new, awesome Cajun Cauliflower Rice Recipe. SO good. Works great as an appetizer, too. That’s it! Easy enough! It’s definitely a favorite recipe here, my friends. Love it! Pretty low calorie. I could eat this all day. Let me know how it turns out for you. Super curious! Send pics! 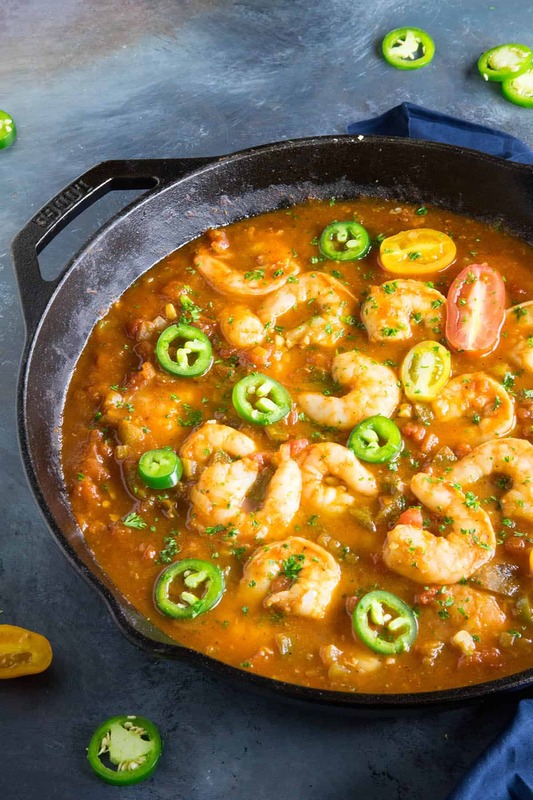 — Mike H.
This recipe is pure New Orleans, an icon of Louisiana, with succulent shrimp simmered in a perfectly seasoned tomato sauce made with the Cajun holy trinity. You may need to make an extra large batch. I'll take mine extra spicy. Heat a large pan to medium heat and add the olive oil. Add the peppers, onion and celery and cook them down about 5 minutes to soften. Swirl in the tomato paste and cook another minute. Add the canned tomatoes, stock, Worcestershire sauce, hot sauce, Creole seasonings and bay leaves. Adjust for salt and pepper. Stir and simmer the sauce for 20 minutes to thicken and let the flavors develop. You can simmer longer if you’d like. Add the shrimp and tuck them under the sauce. Cook another couple minutes, or until the shrimp is nicely pink and cooked through. Serve over rice, if desired, sprinkled with parsley, extra hot sauce and extra peppers! Heat Level: Mild (or Medium with Jalapeno peppers). If you'd like a spicier version, use extra Creole seasoning in the recipe. You can also add in spicy chili flakes, spicy chili powder, extra hot sauce, or use hotter peppers, such as the serrano. recipe for shrimp creole was wonderful. I used both green bell and jalapeno. hot sauce.. hubby who likes hot and spicey said too spicey. Thanks, Debra! Super happy you both enjoyed it. When I saw this recipe I realized that I hadn’t made it for years. I will check the recipe I used but expect I will use yours. Really, if mine was that good, I wouldn’t have forgot about it! Thanks. I am putting it on the menu for tomorrow. Let me know how it turns out for you. I hope you like it! It’s definitely a tasty dish.